Just because you want to be able to enjoy the convenience of vaping on the go doesn't mean that you should have to give up the efficiency that you enjoy with your favorite desktop vaporizer. That's why Arizer has developed the Arizer Air Vaporizer to bridge the gap between the efficiency of desktop vapes and the portability of compact hand-held device. This revolutionary device lets you enjoy the pleasure of vaporizing dry herbs on the go without requiring you to give up the smoothness, flavor or potency that make you love to vape. Although the Arizer Air measures only 4.8 inches in length by 1.14 inches in diameter, this dry herb vaporizer offers truly impressive performance. Ready in just 1 to 2 minutes, it heats aromatic blends evenly with its ultra efficient ceramic heating element. 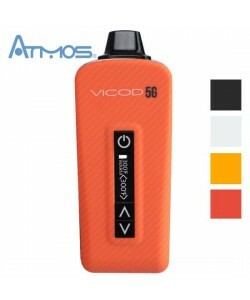 To preserve the potency of your vapor, the portable vape features a glass vapor path, and a silicone skin is provided to shield the vaporizer from scratches and scuffs. Unlike other best vaporizers, the Arizer Air features a replaceable battery design. This gives you the freedom to purchase spare batteries to keep charged and at the ready to quickly substitute when one is completely drained. On a full charge, the herb vaporizer provides up to 1 full hour of vaporization, and there is space in the included carrying case for stowing any spare batteries to keep the vapor flowing beyond an hour. When it comes time to charge the Arizer battery, you can vape while the battery is being replenished, thanks to the pass-through technology used in the design of the handheld vaporizer. The Arizer Air Vaporizer features advanced temperature control technology, offering you five different heat settings to choose from with options ranging from 356 to 410 degrees Fahrenheit. This gives you the ability to get the best vapor production possible out of every type of dry herb that you choose to vape. Setting the vaporizer is easy with the arrow buttons, and the LED indicator light shines in five different colors, so you can tell at a glance what level it is set on. Simple to use - Review by Roger M.
I love the Arizer Air because it is simple to use. It only takes around a minute for it to heat up which is exciting because I can essentially vape whenever I want to. It charges quickly but the battery drains swiftly. Since it has an extra exchangeable battery that can go into it, it isn't really a big deal, though. I love that reloading it is simple too. It is easy to clean and only takes the use of rubbing alcohol in order to accomplish this. I like the low draw resistance and the comfortable vapor that it produces. Recommended - Review by Louis C.
It came really fast in the mail after I place the order here. I recommend this to anyone who wants a solid vaping experience. There is really nothing to complain about with the Arizer Air aside from the battery life, but batteries are rechargeable and replaceable. Upgrade - Review by Julie L.
I recently upgraded from another vaporizer and there is no comparison to the way Arizer Air runs. I think this is the best vaporizer purchase I have made in a long time. Amongst the best - Review by Shawn M.
The vapor quality is among some of the best I have ever had and it doesn't burn my throat like other vaporizers I have tried. Large glass tube - Review by David D.
I think that it is too obvious to use in public since it has that large glass tube and mouthpiece on it. But, it is a good vape to use at home on my own. I don't think it would be good in a party setting but I have not tried that yet. Awkward - Review by Joan H.
It is really easy to clean and is practical for everyday and all day use with the batteries that are replaceable. It can be a little bit awkward to travel with. Vapes smoothly - Review by Julianna A.
Arizer Air comes with really great vapor quality, and it hits really smoothly so that's a perk. I'm glad I did - Review by Joseph L.
I own a lot of really high end vaporizers so I thought I would give this one a shot and I'm glad I did. I read some reviews and got an extra battery to go with it along with a battery charger so the weak battery life hasn't really been an issue for me. The batteries are swappable so it kind of makes up for the rest of it. Allows to change batteries - Review by Rebecca J. The Arizer Air is great for personal use. It is amazing, actually, and I'm not sure I want to use any other vape for dry herbs. It offers me easy clearing with just some isopropyl alcohol so that I do not have to spend too much time on maintaining it. Using it is simple and takes no effort to figure out. I was worried that there would be a learning curve to go through when I bought it since this is one of the first ones I’ve used. The one thing I will say is that it is not necessarily a good vape to have around if you want to vape with more than one person. Also the battery is kind of weak, but since the Arizer Air allows me to change out batteries it isn't that bad. Extra batteries on hand - Review by Eugene S.
I don't need a screen or anything to use it which is nifty, and cleaning the Arizer Air is as simple as taking care of the mouthpiece with rubbing alcohol. The swappable batteries make it simple to use it for longer with many batteries on hand, and the construction is easy and feels durable and sturdy in my hand. Excellent build quality - Review by Billie J. The Arizer Air has an excellent build quality that is good from top to bottom. It comes with everything that I need which includes a carrying pouch so that I can take it with me anywhere with confidence. Top choice vaporizer - Review by David C.
I have used it for only around a week, but I think that it might be one of the best vaporizers that I have ever used. Easy to clean - Review by Maria S.
This device is really easy to clean when it's done and it is simpler to use. The vapor quality is excellent. It does not irritate the throat like I thought it might because of the price. But actually, this is a really good vaporizer for the price. I love it - Review by Helen R.
The Arizer Air is portable and lightweight, I love it. I can take it with me anywhere. A little weak - Review by James J. It is smooth to hit and comfortable with every draw. The first two power settings are the best for me and I think that anyone who is starting out will benefit from the lower heat settings as well. A spare battery is definitely recommended. I say this because the battery is a little weak and dies fast but if you have an extra 18650 then it won't be such a big deal. Easy to operate - Review by Theodore A. The operation of the Arizer Air is easy to handle and it is straightforward to operate. Nice grip - Review by James R.
The silicone skin is nice for the grip and it's really slender so it's simple to carry around with me and it won't look like any sort of vaporizer but more like an electronic cigarette. The mouthpiece has a silicone cap that can be put on the mouthpiece itself. Just be careful about the plastic mouthpiece, because it can chip and crack somewhat easily. Great device - Review by Nicholas L.
Arizer Air is great, I recomand to purchase an extra battery, but other than that, it is a great device. Just change out the batteries when it gets drained out. Love it - Review by Maxine W.
I was new to vaporizers in portable use before I tried the Arizer Air out, and I love this one. The Air model was everything that the reviews say that they are and I love it. Difficult for newbie - Review by Katherine P.
I have been looking at some of the other reviews that say low temperatures are best. I haven't tried that yet, but I like the hottest settings even though the herb doesn't seem to burn up as fast. That's my only problem, as they seem to burn up too fast. I’m still a beginner so there is a lot to learn but I would recommend this vaporizer to any person. Comfortable - Review by John C.
This vaporizer is comfortable to hold, easy to use, compact and effective. Top brand - Review by Susan B.
I have tried a few other vaporizers, but I don't like them as much as the Arizer Air. A high-end vaporizer - Review by Robert K.
The vape quality at the low temperature is similar to the ones that I have used on more high-end vaporizers. Other than the charging, I don't have a problem. Air vape is awesome for the price especially. It works like I expected it to. This is the vaporizer that I want to use for a while and it has replaced my other ones. Hits really well - Review by Daniel E.
The Arizer Air is a vaporizer that hits really well and is easy to use. It hits really well and added caps that come with the mouthpieces are a big plus keeping it clean. One of the best vaporizers - Review by Paul C.
I am so happy with the Arizer Air. It offers a totally clean vape every time on the lowest setting, which is the blue setting. Every hit is even and easy to pull. With a higher vaporizing temperature it is less uniform and the vapor isn't exactly clean but it is still one of the best vaporizers that I have ever used. Other than charging, there is really no maintenance that I need to perform in order to get it going. The only flaw in the Arizer Air is the battery life. This is why I'm glad that it has an interchangeable battery. Heats up in 30 seconds - Review by Dwight M.
I love the huge 18650 battery and it powers it up easily. It heats up in like a single minute, which I love. Keeps its charge - Review by Elizabeth P.
I really like the removable and replaceable battery, which is great for taking with me out in public so I don't have to worry about keeping a charger with me. Arizer Air can also stand upright and doesn't have to sit on its side like some of the other vapes when it's plugged in. Lasts an entire day - Review by Lee C.
I love that the Arizer Air lets me vaporize while it is charging so that I am never without a vaporizer. Lightweight - Review by Javier A.
Arizer Air vape is really slender and has a good feel to it. This unit is also really lightweight and easy to tote around. It offers good vapor production and the taste is incredible. I like that it does not have a huge smell, which makes it perfect for taking with me in public. Removable battery - Review by James N.
I love the removable battery that the Arizer Air comes with. This makes it easy to change them out when one dies when I am on the go. This is great so I don't have to carry around a battery with me at all points in time. Heats up fast - Review by Sean M.
It is fast when it heats up, easy to pack and to clean and is totally portable. I prefer something that I can take with me anywhere and that's exactly what I get with the Arizer Air. Easy to use - Review by Joanne L.
I prefer the Arizer Air over my other vaporizers because it is so easy to use. This isn't a flashy portable, but it's the absolute best you can get for such a price. It has 5 heat settings, but I only use the highest one, so that I get all the flavor and good stuff out of my material. It is super efficient. Everything comes out nice and toasty. You don't have to fuss around with this vaporizer at all. You just load it and go. The hits are big and I find it's great for sharing. It works best when you grind your herbs finely but all vaporizers are that way. Tapping your stuff down really flat makes it way better. One thing to keep in mind, when you're using Arizer Air on the hottest setting, is that it's going to get hot. I don't mind it, but some people might think it's too hot. I have a friend that likes it better on the lower settings. The only thing I don't like about the Arizer Air Vaporizer is that the battery only lasts about 1 hour. Once it's halfway charged, you can vape while it's plugged in though, so it's really not that big of a deal. It only 40 minutes to charge, so it's a lot faster than other vapes in that respect. A convection vaporizer is just plain better, and the Arizer Air is the only vape that really is a good vape, in my experience. You have to master the art of using it, but once you do, you won't believe how good the vapor tastes. You don't have to ever worry about combustion, and the vape looks so good. The Air Vape is like the iPhone of vaporizers. If you want the best, it's what you should buy. VaporPlants.com gets my vote for the very best online shop for vaporizers, and all their other products. Their prices are great and so are the products' quality. This vape shop was the first vape site I ran into, and don't plan on looking any further. You have the best service, best shipping, and the very, very best products anywhere. Thank you and stay cool! I love VaporPlants.com, and get all my supplies from you people. Your site is the easiest place to get around, your products are to die for, and your shipping and customer service is above the rest. If I have questions, I can email and get an answer within an hour or two, and if I call I am treated with the greatest respect. No question is too silly, simple, or difficult. Everyone here knows how to treat people, is very knowledgeable in the products, and will bend over backwards to help you out. I purchase everything for my vaping needs right here, I have no reason to look any further. Just had to stop in and leave my two cents worth, lol! I really needed help choosing a vaporizer; from the model, to the style, to the design. I called customer service and experienced the very best, professional assistance ever! I had tons of questions, and he answered everyone gladly. I received my Arizer Air herb vaporizer in like three days! I am truly impressed, and will be shopping with VaporPlants.com from now on! We have purchased the Arizre Air vaporizer from you and I couldn't be more pleased! It's excellent quality and exactly what I was looking for! I will be purchasing everything from VaporPlants.com from now on! Thanks!